One major event in every wedding celebration is the Mehndi ceremony. Be it a fun-filled event with everyyyyone present or a laid-back small affair, every bride has to get her hands decked in these red-black henna swirls. Whether you like it or not, Mehndi is just mandatory! And of course, the goal is to achieve the darkest possible shade. Because, apparently the darker the Mehndi, the stronger your husband’s love. But superstitions aside, it really just looks so much better if your Mehndi is a nice, rich shade, instead of a fading, feeble one. 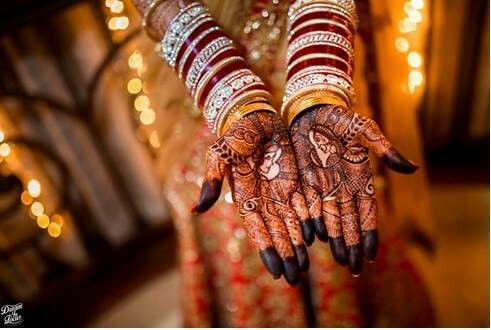 So here are the top tips and tricks to help you get just the darkest Mehndi colour that you desire to have. 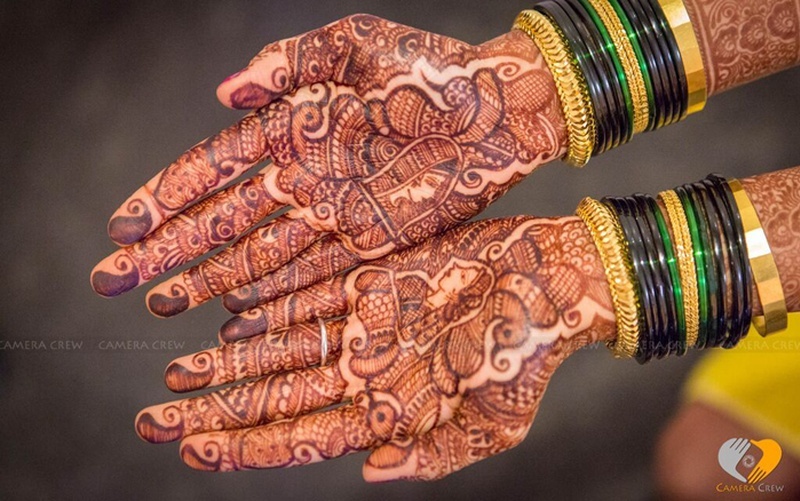 Also check our fab Mehndi ideas for some gorgeous styles to incorporate! Well, there’s a reason why the Mehndi ceremony is held 1 or 2 days prior to the wedding. Give it time to set in and taking care of it the right way in the following day or so could enhance its colour. The wax or razor or the treatments done could peel of the top layer of your Mehndi, resulting in a dull colour that nobody likes. But yes, make sure you DO get waxed/shaved sometime before the Mehndi ceremony as the hair would just be an obstruction. Be sure to wash your hands before the Mehndi is applied so that all the oil and dirt is gone. Avoid using lotions or moisturizers as they will create a barrier, resulting in the Mehndi not setting in as well. One product that you can apply on your hands/feet before the Mehndi application is Eucalyptus oil. It will enrich the colour of your Mehndi and the results are great. You could also just add Eucalyptus oil to the henna paste itself. Avoid sitting directly in sunlight as you get your Mehndi done. Though, good lighting is definitely required for the designs to come out intricately. If the Mehndi ceremony is outdoor, ensure that you are under a shade or shelter or some kind. Once your Mehndi is dry, apply a mixture of lemon and sugar to keep it moist enough so it doesn’t start cracking and falling off. Just mix some lemon juice with sugar, warm it up and apply it lightly on the Mehndi. Once the mixture is dry, apply mustard oil on it so the stickiness goes away. Heat some cloves in a pan and place your hands above them so the fumes reach them. Take them off once they start to hurt and repeat as and when desired. The smoke is said to darken the colour of the Mehndi. When your Mehndi is dry or when you’re going to sleep, wrap it up in a film, bandage, medical tape or glove to make sure the design is not ruined over time. The warmth provided by not exposing it also helps in darkening the mehndi colour. DO NOT wash your hands to remove the dried henna from your hands. The best thing to do is to gently scrape it off. Avoid soap and water at all costs for at least 6 hours. It is advisable to fall asleep with Mehndi and scrape it off after a good 12 hours after the application. Once you do pass a duration of 12 hours and you have scraped off the Mehndi, apply Vicks VapoRub or Vaseline to further warm up your skin and get a richer shade. Another alternative is to use pickle oil. > We suggest that you keep all the necessary materials ready so your Mehndi artist has easy access to it as when she needs. This included things like newspaper, cloth, etc. Breaking the flow of application could result in varying tones or uneven designs. > Bathe before you apply the Mehndi as you will have to avoid water after the application. This way you will not be in any rush to do so. > Wear comfortable clothing as Mehndi application is a time-consuming process and the more relaxed you are, the better. > Use the washroom beforehand as going to the loo with Mehndi on your hands is definitely going to be tricky! > Avoid blow-drying or putting your hands in front of a fan to dry it up quickly. This can damage the intricate designs. Check out our take on unconventional Mehndi for modern brides!